Video: Home & Family: Michelle Ebbin. Video: Michelle Ebbin Presents to Phillips Academy Andover . Video: Michelle Ebbin On Air Reel. Video: Live with Regis & Kelly: Michelle Ebbin. Video: Michelle Ebbin Introduction - "The Power of Touch" . Michelle Ebbin is a renowned expert in touch therapy and wellness. Since founding her company Basic Knead in 1994, Ebbin has been committed to increasing awareness of the healing power of touch and teaching touch therapy techniques to relieve stress, soothe the body and mind, and improve overall wellbeing. Her latest book, The Touch Remedy: Hands-On Solutions to De-Stress Your Life (HarperElixer) received the publishing industry’s top Gold “Living Now” Book Award for 2016. A fresh, contemporary approach to natural health, which draws on a unique combination of ancient wisdom and cutting edge research, The Touch Remedy is a collection of proven touch therapy solutions to calm and heal every member of the family, from babies to grandparents to pets. Demystifying time-tested touch therapy techniques such as Acupressure, Reflexology, Cranial Sacral Therapy, among others, Ebbin shares her invaluable insight and provides clear, step-by-step remedies, accompanied by beautiful full-color photos, to relieve a range of physical and emotional stressors, from back pain and headache to anxiety. Her solutions are quick, taking only two-to-three minutes each, and easy, requiring only three steps, and most of the remedies can be done anytime, anywhere, even on the go. A graduate of Columbia University, Philips Academy Andover, and the institute of Psycho-Structural Balancing, Ebbin has authored four books on massage, produced six award-winning massage DVD’s, and created best0selling massage products that have helped thousands of people discover the power of touch. Ebbin is a Certified Infant Massage Instructor and member of the International Association of Infant Massage, American Massage Association, and Reflexology Association of America. 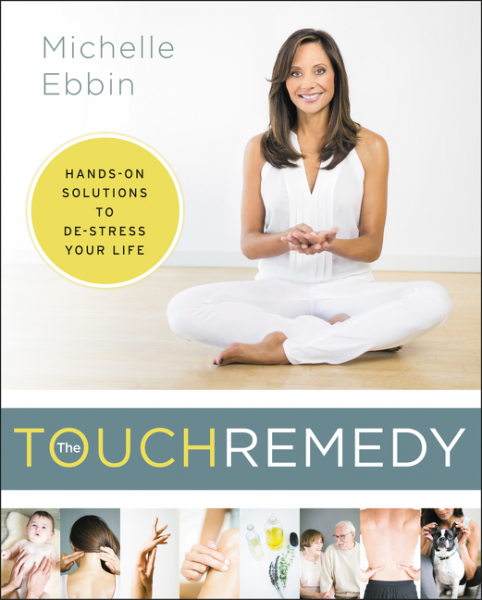 A former massage therapist to many celebrities, including Ashley Judd and Salma Hayek, Ebbin appears regularly in the media on outlets such as The Dr. Oz Show, The Doctors, Home & Family, and The View to discuss the benefits of touch, to teach touch therapy techniques and encourage everyone to bring more touch into their daily life. Currently, Ebbin is working with City of Hope, a leading research and treatment center for cancer, diabetes and other life-threatening diseases, to develop a massage program within their Biller Patient and Family Resource Center. Her goal is to make touch therapy available to all patients undergoing medical treatment, as well as to their caregivers and family members. She believes that when people are sick they need touch the most, and that cancer treatment should include care for the patient and the family, not just the cancer. A portion of the proceeds of The Touch Remedy will go directly to the City of Hope.